All-electric Enfield Bullet now rides on Ensigns. - Vintage Tyres All-electric Enfield Bullet now rides on Ensigns. All-electric Enfield Bullet now rides on Ensigns. Fred Spaven’s all-electric Charging Bullet looks amazing fitted with a brand new pair of Ensign Universal tyres supplied courtesy of project sponsor Vintage Tyres of Beaulieu. The vintage tread pattern really suits the ’60’s vibe of the Bullet. 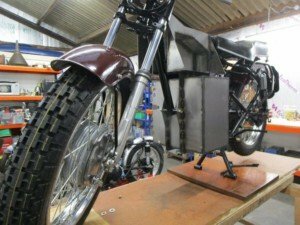 Fred’s also fitted the centre stand, a very slightly modified standard Enfield part, meaning he can do away with the inconvenient axle stands. The tyres really help the look of the bike and it’s nice to see the shape of the finished bike coming through at last!